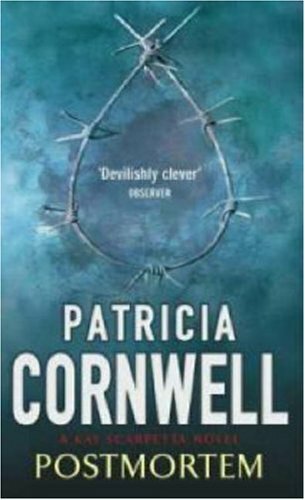 My contribution to the Crime Fiction Alphabet this week is a discussion of former crime reporter and forensic analyst Patricia Cornwell’s debut novel, Postmortem. It was published in 1990, won the Edgar, Creasey, Anthony, and Macavity awards in a single year and ushered in a new sub-genre of crime fiction in which forensics is king. The success of this book and its follow-up novels is thought to have influenced a swag of similar writers (including Kathy Reichs, Tess Gerritsen and Karin Slaughter) and also TV shows like CSI. As Postmortem opens Dr Kay Scarpetta, Chief Medical Examiner for Richmond Virginia, is sleeping uneasily. For each of the previous three weeks a woman had been strangled to death on Friday night and Scarpetta worries there will be another death. When the phone call from Detective Pete Marino comes at 2:33AM on Saturday morning she is called to another scene where there are few clues to the perpetrator of the horrid murder. Scarpetta and Marino work with FBI Profiler Benton Wesley to track the killer down using what little evidence they can find as well as manipulating the media to play with the killer’s head. Several elements of this book would, today, read like hackneyed clichés but Cornwell was breaking new ground when she released Postmortem. For example, at that time the DNA profiling was a relatively new technique but it is incorporated cleverly into the story. Having such a strong female character as the protagonist of the book, especially one engaged in such a gruesome activity as dissecting dead people, was something else that was something of a departure for crime fiction at that time. Kay Scarpetta is a long way from Miss Marple. I can recall thoroughly enjoying Postmortem (as much as you can enjoy a book in which women are dying horribly). There was a genuine puzzle to solve and the characters did engage me and, although violence was graphically depicted it did not seem to be out of step with the story or my own sensibilities. I read the subsequent novels as they were published and though Point of Origin (book #9 in the series) was the last one I actually liked I slogged it out right up until 2004’s Trace (book #13) which I deliberately left on a bus after finishing because I thought it was one of the worst books I’d ever read. I haven’t read a Scarpetta novel since (though I did have a go at one of Cornwell’s Win Garano novellas last year). I’m not entirely sure if it’s me that has changed or Cornwell’s writing. From my perspective the plots seemed to get both more graphically violent and more ridiculously unbelievable. In Trace for example a character who has been dead for several books makes a miraculous reappearance accompanied by a nonsensical cover story. When combined with the ludicrous things that Scarpetta’s niece Lucy (computer genius, FBI superstar and borderline psychopath) gets away with this direction for the series consigned it to the ‘jumped the shark’ category for me. However, I try not to let my later disappointment overshadow the fact that Postmortem is a great piece of crime fiction. About 18 months ago Cornwell was the featured author on the BBC World Book Club and Postmortem was the book under discussion. You can listen to the show’s archive in which Cornwell is questioned by the show’s host and its audience should you be so inclined (the link will open your computer’s streaming audio player). This entry was posted in Crime Fiction Alphabet, memes and challenges, mini review, Patricia Cornwell, USA. Bookmark the permalink. Thanks for this one Bernadette. Like you, I had a time when I looked for every Cornwell novel, and then something happened. It is hard to pin point what. Your evaluation is so precise and fair. She started out really well, but after several books Scarpetta and those around her have been involved in some eternal, nightmareish conspiracy (the world against Scarpetta, Lucy and whatshisname). No sensible reader could believe in those plots. I have liked a lot of cornwell books. Somehow down the line I lost interest. Here is my Crime Fiction Alphabet: P post! I agree Bernadette. I used to rush down and buy the latest Cornwell in hardback and then she or I changed. I think she forgot to write believable plots after about From The Potter’s Field, and I became so irritated with the brainless behaviour of Lucy I lost interest. Sorry to chime in rather than provide an elegant variation, but I agree too. Thomas Harris (who was perhaps the precursor of Cornwell?) is similar but has not written so many books. (I liked Red Dragon, was disturbed by the gruesomeness of Silence of Lambs, left it in hotel room but did quite like it, hated Hannibal and did not touch Hannibal Rising with a bargepole). The Scarpetta books began well apart from the killing bits – but they soon got so slooooooow and boring, people dying in one book and reappearing several books later after reading endless pages of misery about it, boring descriptions of gated communities and home security features, etc. (Run out of plot ideas?) Anyway, I gave up after the first half dozen and don’t regret it for a minute.